Beach Sports - Low-tide is the best time to go snorkelling at Hamilton Island. Beach Sports have been handfeeding the fish at the same spot for 15 years – so snorkellers will be delighted with the thousands of fish that converge on the fringing reef around Catseye Bay. At high-tide the waters of Catseye Bay come alive with the action of windsurfers, catamarans, jet-skis and paddleboards. The team at Beach Sports are always on hand for a bit of expert tuition on handling the watercraft. Sea Kayaking Whitsundays - Sea Kayaking operates full and half day tours daily and include an Adventure paddle, a Sunset paddle, a Turtle and Sea Eagles tour and even a Full Moon Tour. Watersports - For a bit of speed on the water you can’t go past the waterskiing, wakeboarding, parasailing, tubing or speedboat adventure rides operated by the Watersports Shop. Whitehaven Beach - The picturesque Whitehaven Beach is one of the regions beautiful natural attractions. The beach is 8km of white silica sand with clear blue water surround. Fantasea have daily trips with buffet lunch onboard and volleyball and cricket activities on the beach. 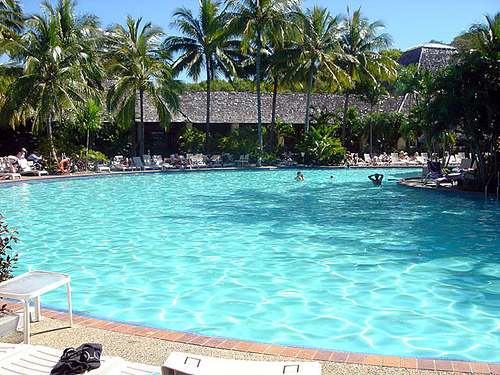 Island Pools - Hamilton Island has five swimming pools and is building a new one at the Reef View Hotel. The main pool has a swim-up island bar, while the tropical Bougainvillea pool is serviced by the nearby Bougainvillea Bar. The Bougainvillea Pool has a shallow children’s wading pool. The Dolphin Pool, adjacent to Toucan Tango Café & Bar is 2.4 metres deep and is perfect for practicing diving.